• CBD Decision X/33, 8 (w) on geoengineering remains valid and should be affirmed and strengthened. • The potential impacts of geoengineering on biodiversity have been scarcely studied. Studies and policy recommendations on the impacts on biodiversity and associated livelihoods caused by any geoengineering intervention are, and should remain, under the mandate of CBD and its bodies. • New research papers continue to demonstrate high risks and uncertainties associated with the full range of geoengineering proposals. • Recent studies indicate that geoengineering proposals such as BECCS (bioenergy with carbon capture and storage) would have significant negative impacts on biodiversity, food security and livelihoods. • The concept of “negative emissions” techniques is highly speculative and does not have proven viability. This poorly founded concept is used to justify geoengineering proposals that will have grave impacts on biodiversity and traditional livelihoods. • Geoengineering functions as “the perfect excuse” for high carbon emitters to avoid real GHG reductions, a key measure that would help to protect biodiversity. • Demands for geoengineering experiments, as well as suggestions to consider geoengineering proposals “case-by-case,” are slippery slopes. 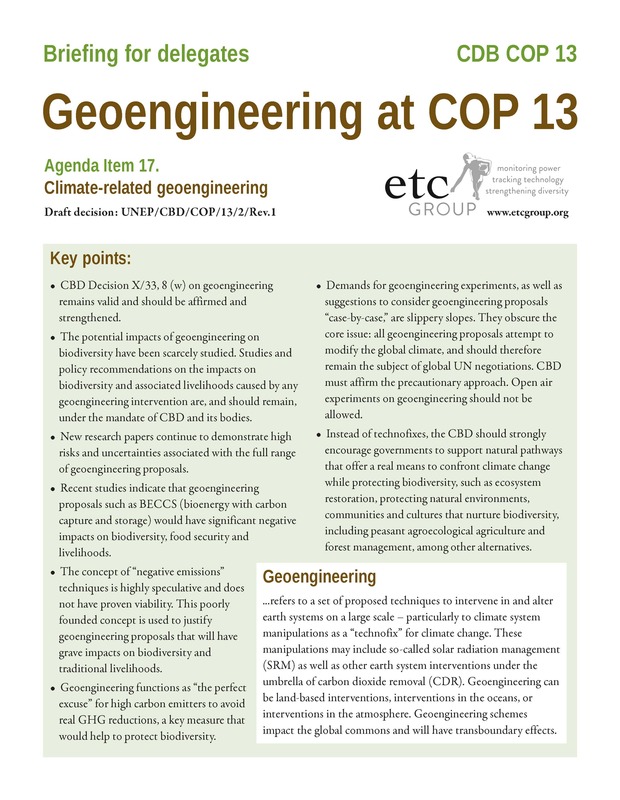 They obscure the core issue: all geoengineering proposals attempt to modify the global climate, and should therefore remain the subject of global UN negotiations. CBD must affirm the precautionary approach. Open air experiments on geoengineering should not be allowed. • Instead of technofixes, the CBD should strongly encourage governments to support natural pathways that offer a real means to confront climate change while protecting biodiversity, such as ecosystem restoration, protecting natural environments, communities and cultures that nurture biodiversity, including peasant agroecological agriculture and forest management, among other alternatives.